All the basic shmup stuff is here - a range of air targets, ground bases and tanks, giant things to kill at the end of the level. 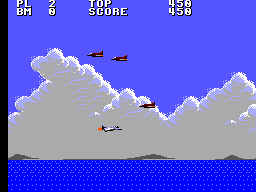 But there's more to it, when high up in the air you face sudden assault from missiles flying out of the clouds, plus slow homing missiles coming from behind. And if that wasn't enough there are random lightning strikes to worry about! It's varied and it sure does keep you on your toes. The thing is, it can't decide what it is. 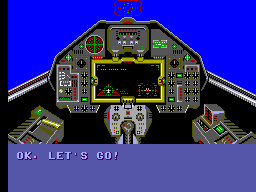 Is it a "present"-based shooter like UN Squadron and Carrier Airwing, or is it trying to be R-Type/Darius? The first three levels are quite sensible - a fight across the ocean, then high altitude and finally over the desert towards the entrance to the mountain fortress. 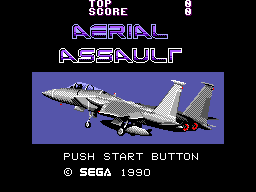 Then it goes utterly bonkers and puts you into a futuristic setting flitting through passageways and finally going into outer space (we'll leave the physics of how an F-15 manages with no air) complete with enemies straight out of every space shmup ever! Aerial Assault does suffer from one huge problem - the power up system. It's basically weapons, bombs, shield and speed. There are two weapons that are actually any good, a missile launcher and a laser cannon. As for everything else? Well you're pretty much better off with your standard spud-gun because it at least has a decent rate of fire and shoots where you want it to. The bombs, but they're little more than a novelty until you get the ultimate great balls of kill everything later in the game. Perhaps the biggest problem lies in the speed powerups - on harder difficulties you can't get to some gun batteries on the level 2 boss without at least one speed-up, and if you die at the level 4 boss you're boned because regular speed isn't enough to get between laser blasts. For all its flaws though, it retains the core element of fun. But it on hard though, because otherwise you'll spend much of the game with little to shoot and even less to dodge. Well, for an 8-bit game made in 1990, they did a great job presentation-wise. The small sprites mean plenty of them can be packed in (though unless you're on hard this doesn't happen 'til the last couple of levels) although other than your craft there's little animation going on. Impressively though, there's no flicker or slowdown and spot-on collision detection. It really gets impressive on level 2, fighting in the clouds. The clouds darken as the game goes on, you dodge lightning flashes and be wary of baddies hiding in the lower cloud cover. It's a shame the rest of the backgrounds are pretty sparse, but in the final two levels some awesome sci-fi sprites knock it up a notch and the whole thing looks pretty impressive. Aside from some suitably silly sound effects to go with the special weapons on the dafter end of the spectrum, the sound effects are pretty solid - unremarkable but functional. The thunder cracks are pretty impressive though (spotted a general theme about level 2 yet?). Likewise the music is relatively inoffensive - it's the Master System so no-one's expecting Thunder Force IV, but it could do with being a bit more lively. One to shoot, two to bomb. Pretty straightforward. If you've got a sensible weapon that has a firing rate then the whole thing is really responsive - the odd weapon that can only have one shot on screen at once gets really frustrating. Even when you've got the full speed-ups going on, you still have precision control over your ship and there's no cheap deaths due to lag between when you press something. It's pretty nails on hard mode - which is a shame because medium is rather easy (as long as you don't die at the level 4 boss). Only 5 levels would normally be a pain, but these are quite long - only the first level drags a bit. A two player mode would've been more fun (although the squabbles over who gets the useful power-ups wouldn't be!) but really I think they squeezed all they could out of the system for this game. A pretty neat horizontal shooter. The good just about outweighs the bad, but that power-up problem is really going to mean this is purely for shmup fans looking for something a bit different - and it delivers enough of that and, if you put it on hard, plenty of challenge. And I'm sure the hardened players will appreciate how not to get angry when you have to start the game over again once you die and lose all your weapons! Looks great, plays great - but has enough niggling flaws to keep it from being enjoyable to a wider audience.